TEC 7100 is one of a series of new generation pneumatic hot melt applicators. The TEC 7100 is probably one of the world’s highest-output hand-held hotmelt applicators. The TEC 7100 is a serious alternative to bulk tank hotmelt systems at a fraction of the cost. Built to a very high standard, the TEC 7100 is totally self contained. 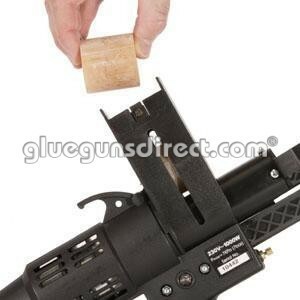 The most unique feature on this tool is the built-in speed loader, which holds an extra two 43mm glue cartridges in reserve. Plus, it also enables the user to re-load in seconds whilst continuing to use the tool. Due to the advanced heater housing design and the powerful dual 500 watt heaters, the TEC 7100 is able to dispense up to 5 kilos of molten hotmelt per hour. Complimented by the vast range of Tecbond shaped high performance hotmelt adhesives formulated for bonding a multitude of materials used in insulation, green roofs, pre-cast concrete moulds, filters, landfill, plus many more challenging applications. Being solvent free and non-toxic there are no environmental problems that are often associated with other adhesive fixing systems, which is a huge advantage with new European Environmental standards being recognised. Do you have an old or broken glue gun? Don’t throw it, exchange it for a new Tec glue gun with a 12 month warranty at a discounted price.